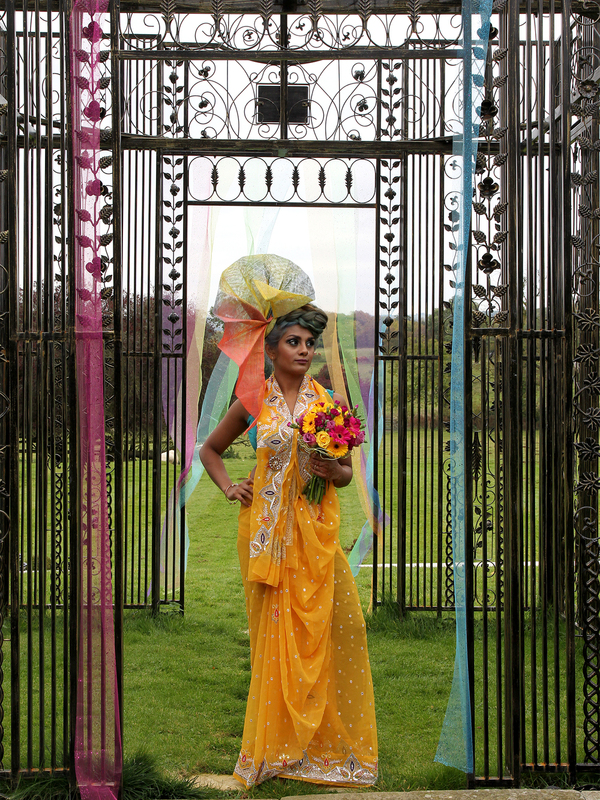 Today I am thrilled to share this vibrant colourful Asian fusion inspired bridal shoot. 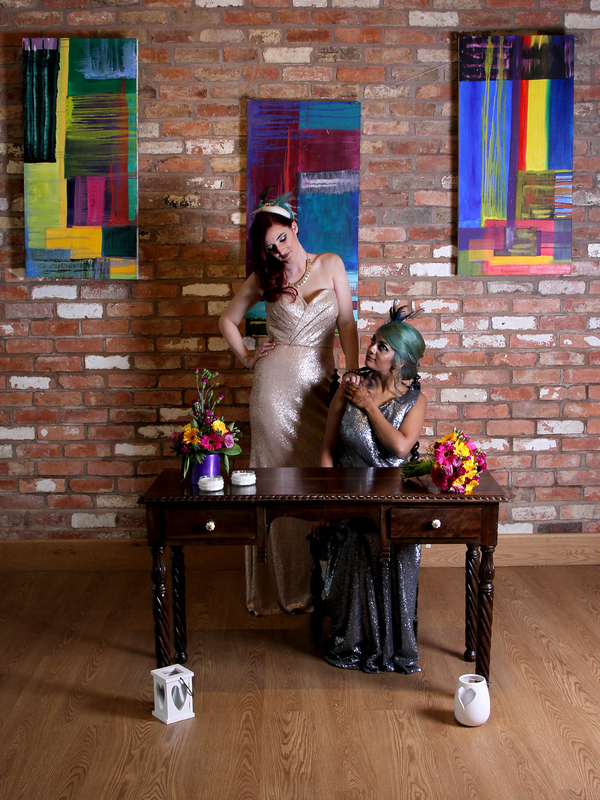 This all female shoot was an eclectic mix of traditional bridal gowns and vintage headpieces with modern and artistic Asian influences. 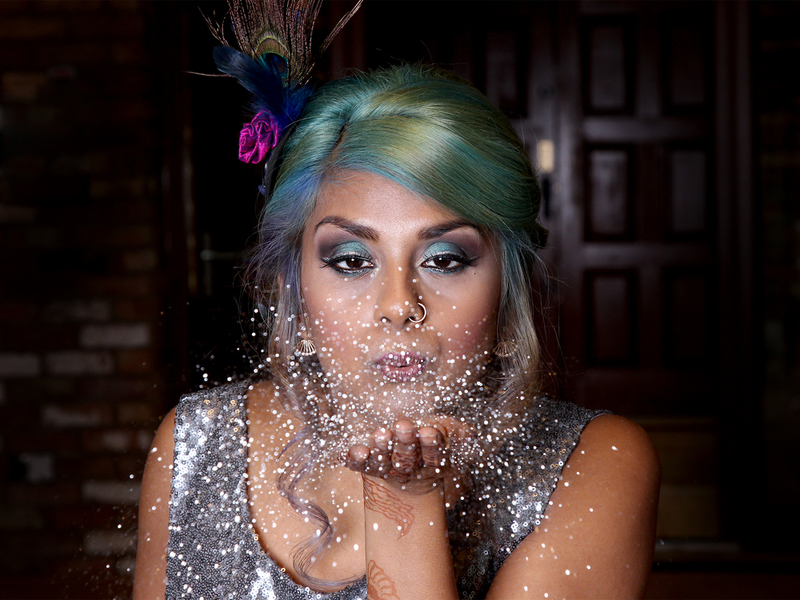 Images were captured by Frankie at Pink Photographics with creative direction by Amy Weaver at Dolls Mad Hattery. 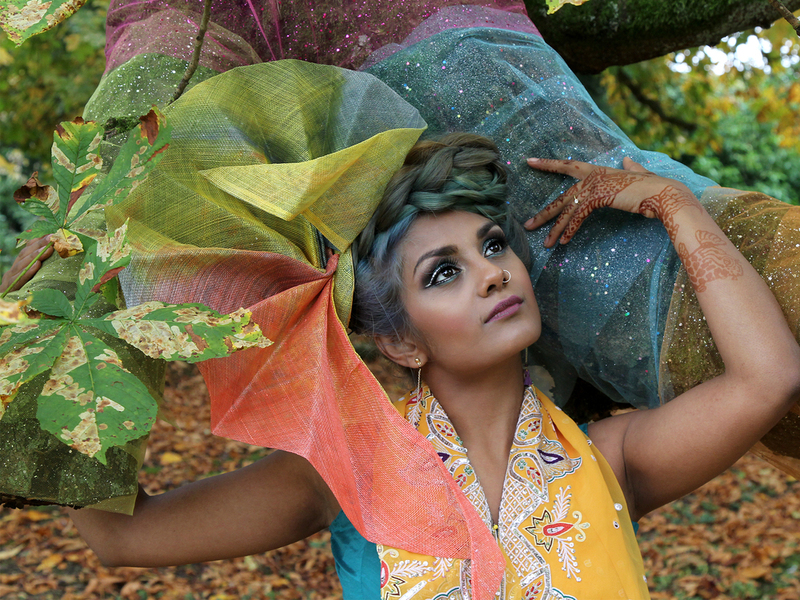 The concept for this shoot began with the vibrant yellow colour that you see running through lots of the imagery. 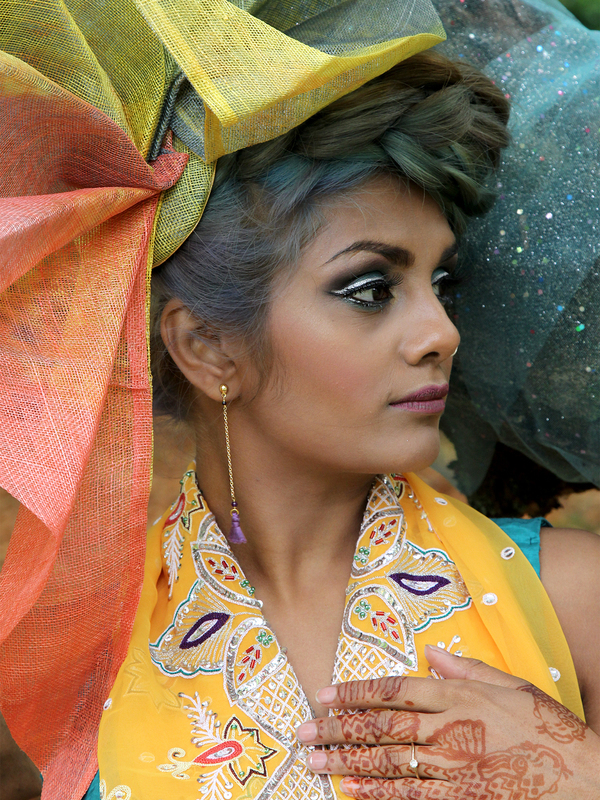 The large hand-dyed swirled shell headpiece combined this yellow with coral and blue and from there I added a pallet of pinks and turquoises with metallics. 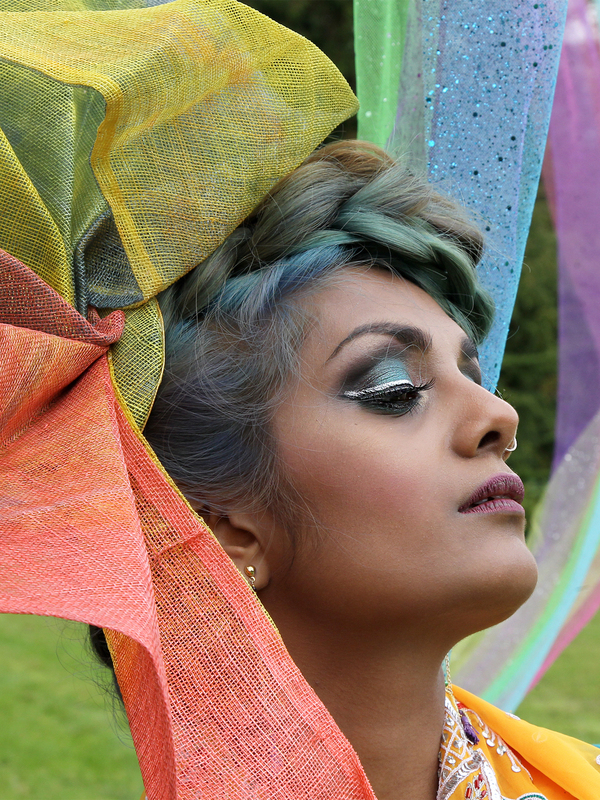 I wanted this shoot to capture some of the vibrancy of Autumn along with drawing on different cultural references for both models. 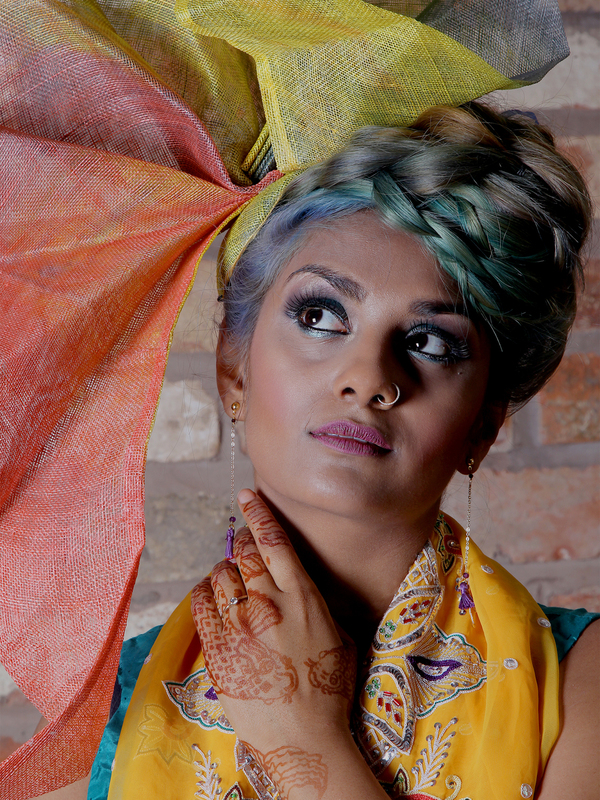 The shoot drew on Asian influences with sarees and henna art of fish, with some modern bright touches in the flowers, cake, smoke bombs and tiny tassel earrings. From the beginning, this was an all-girls shoot, both in terms of cast and crew and it was very much a team effort, with creative ideas shared by some extremely talented ladies. Keythorpe Manor in Leicester is an exclusive use venue with a fixed marquee and barn which we used for the ceremony shots. 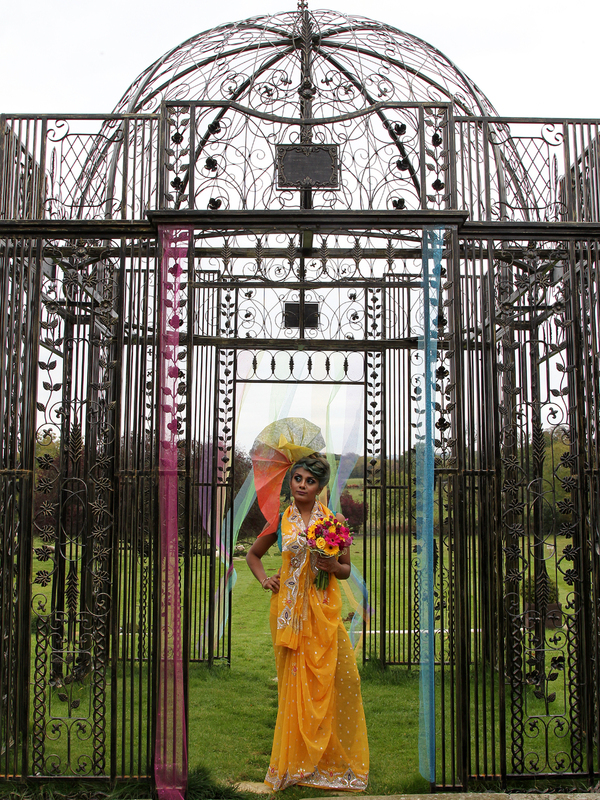 The grounds are stunning, with the tree swing and metal archways being just a few of the gorgeous features. It’s a family run venue and they could not have been more helpful on the day. 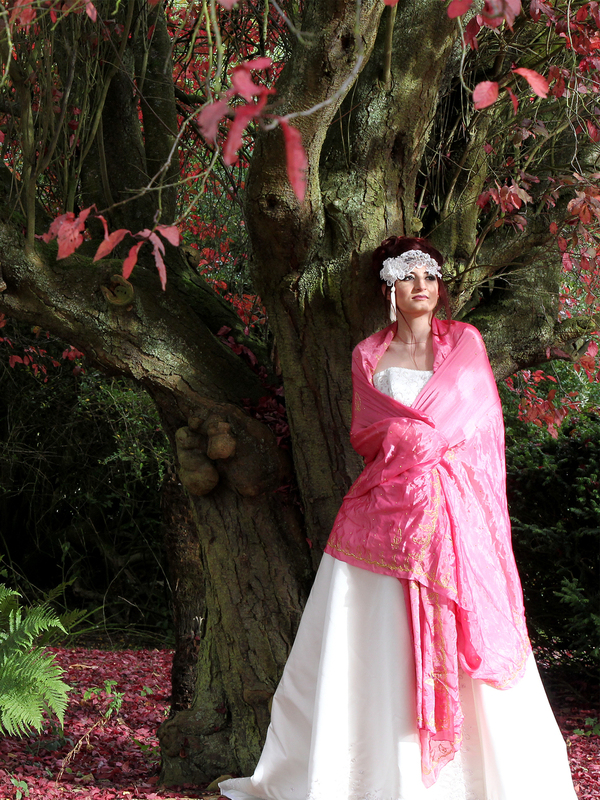 We held the shoot in Autumn and loved all of the gorgeous colours in the trees around the grounds. 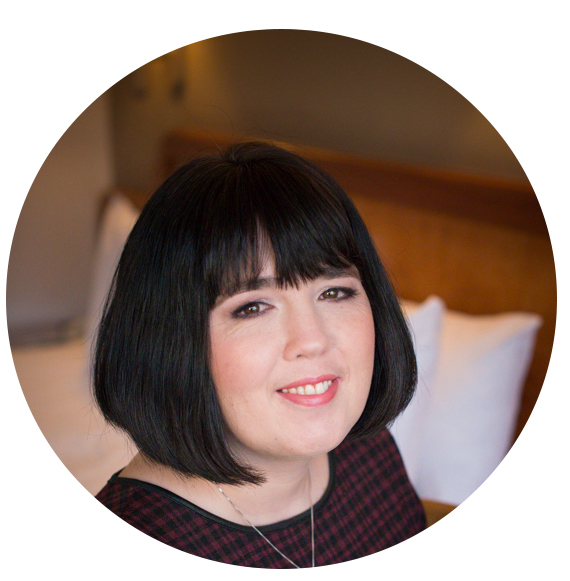 Frankie of Pink Photographics is a wonderfully fun and talented photographer. 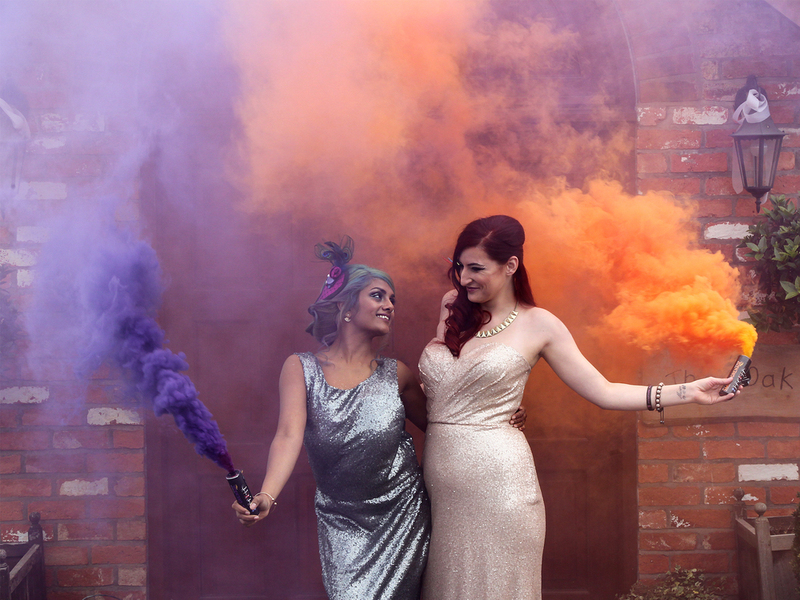 She put new model Kayleigh at ease and kept the rest of the group on task as she ran around the venue directing shots from one set to the next, lying on the floor, rolling in leaves, climbing ladders and introducing us all to the wonder of coloured smoke bombs! These make for a seriously dramatic photo and come in lots of different colours. We opted for orange and purple to tie in with the theme. Plaits and Pin Curls is often referred to as “The Hair Wizard” because she works magic with hair! She created four looks on the models throughout the day. 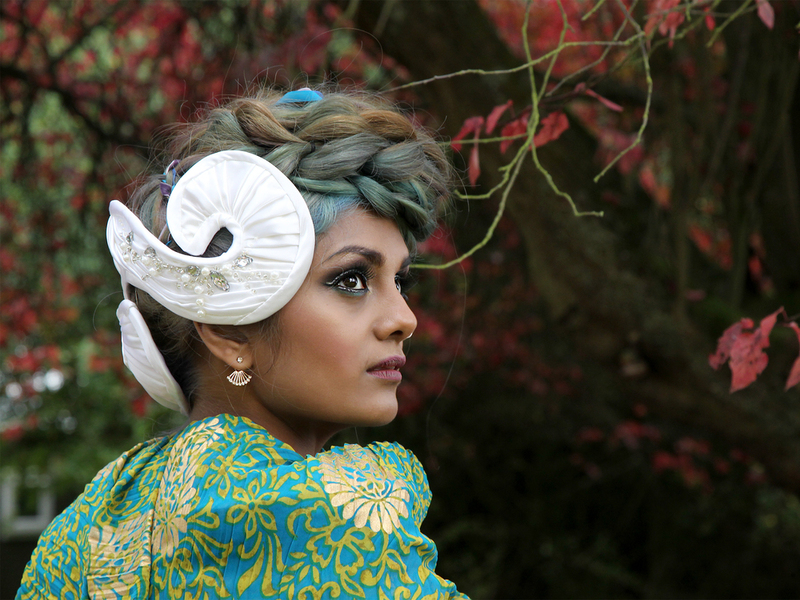 For Kaajel, the first look was a beautiful big plait that showed off her amazing mermaid hair. 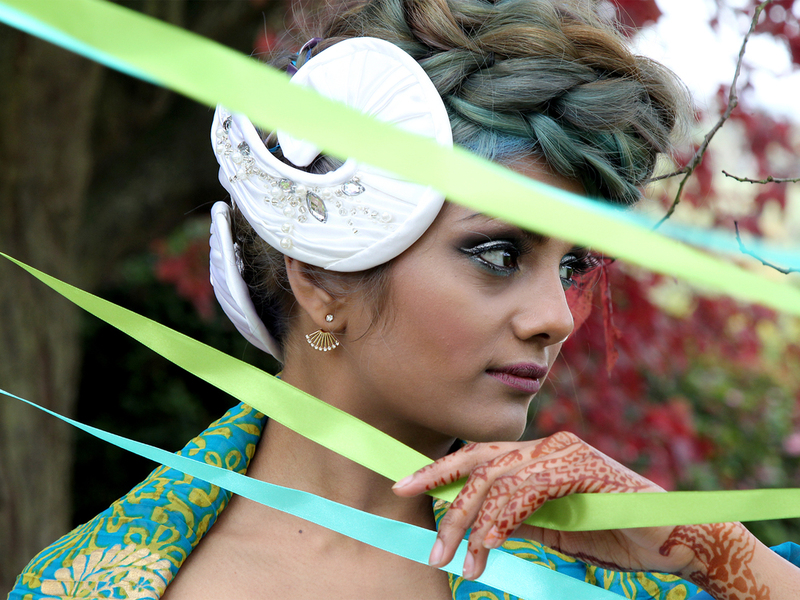 Smaller plaits with turquoise ribbons running through them tied in the colours of the shoot. 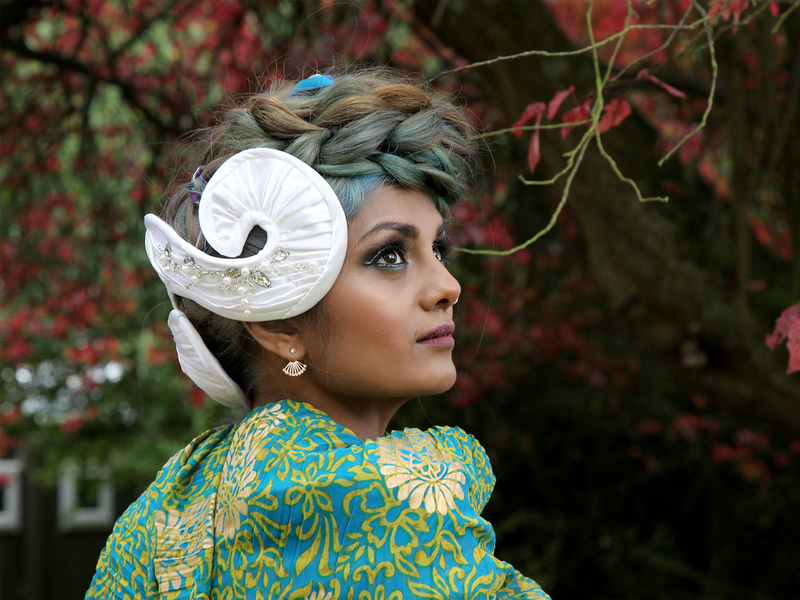 Kayleigh’s first look was a swirled up do with pin curls and loose soft curls. The second two looks for both models epitomised vintage glamour. 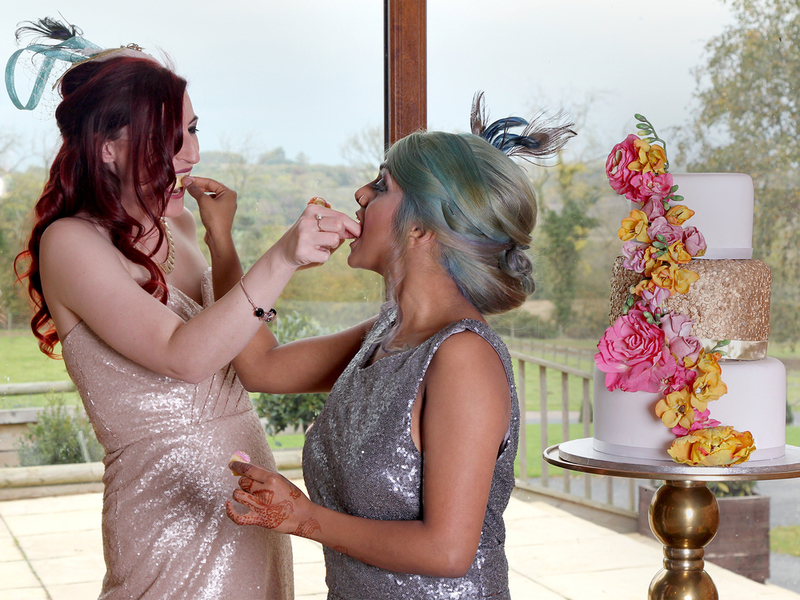 Kaajel’s second look was a low bun with pin curl detail and Kayleigh’s was a side swept half up do with lots of beautiful soft curls. Makeup was by Ruksana at La Classe, who created dramatic traditional Asian bridal makeup looks on both models with a beautiful modern twist on Kaajel of silver eyeliner. 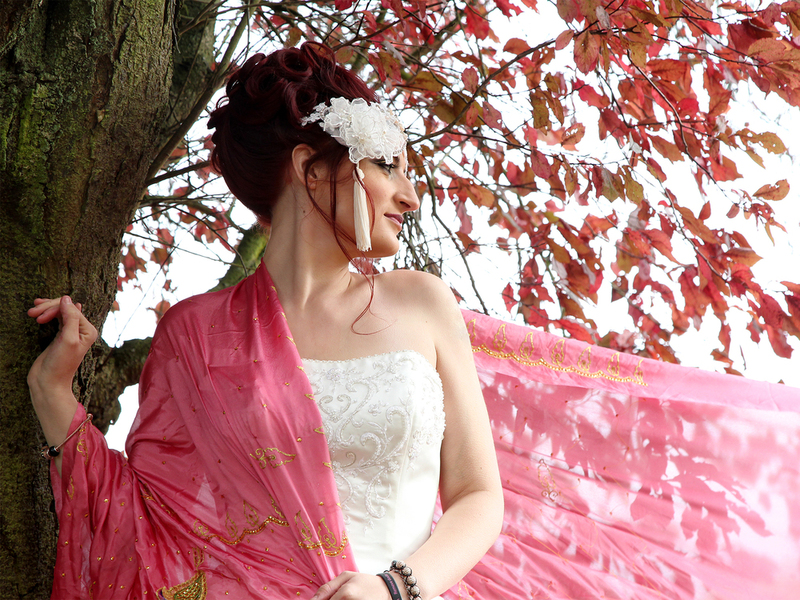 I really wanted to keep the backdrop minimal, with the bare brick walls of the barn and the branches of the trees and have touches of colour in the ribbons and sarees so that the models would really stand out in their outfits. 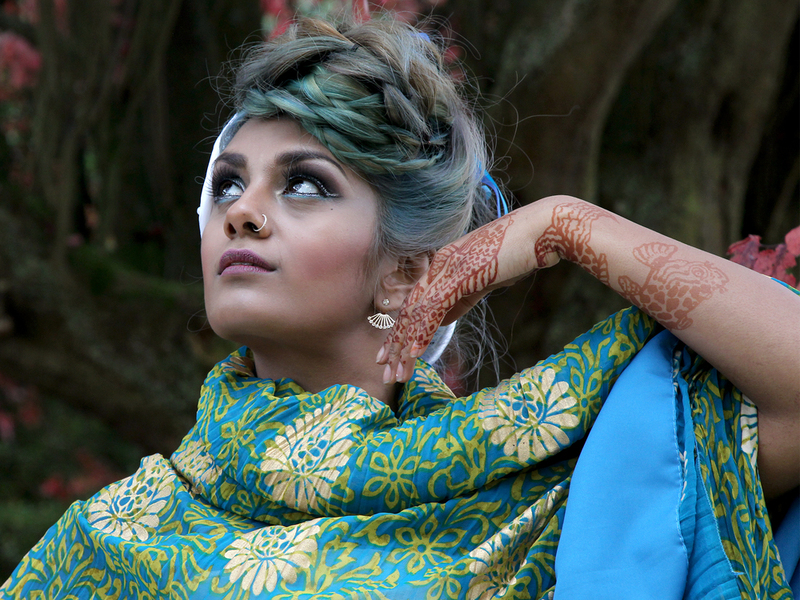 The artwork on the walls was by seriously talented model Kaajel, who also did the henna art of a fish on her own arm. That Black & White Cat helped out with draping ribbons and sparkly tulle in the grounds as well as dressing the ceremony scene and cake table with beautiful coloured candles, lanterns and giant paper stars, showing that a ceremony doesn’t have to be decorated with just flowers. 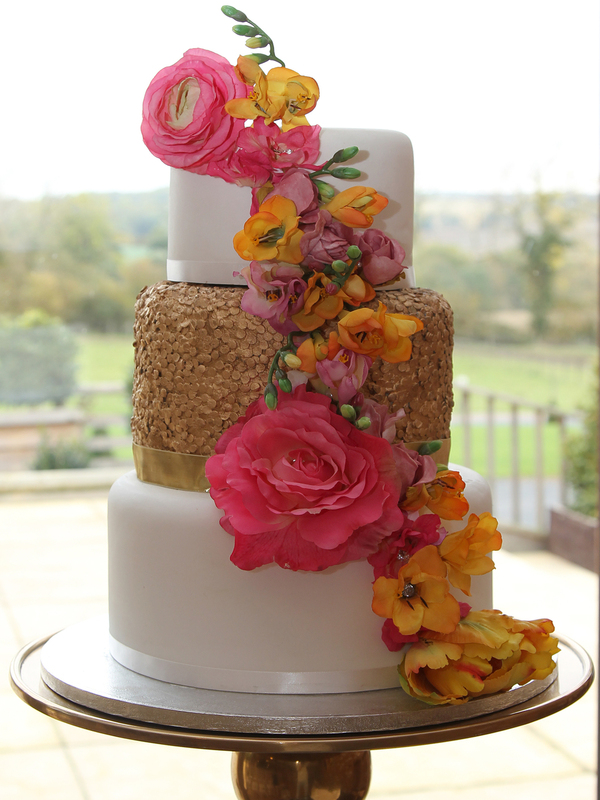 The cake by Strawberry Cupcakes of Nottingham was a three tiered beauty with cascading bright flowers and a central tear of gold sequin effect icing that perfectly matched the glitter dresses supplied by Brides of Ibstock. Not all wedding dresses have to be white and these dresses are perfect for brides and bridesmaids alike. 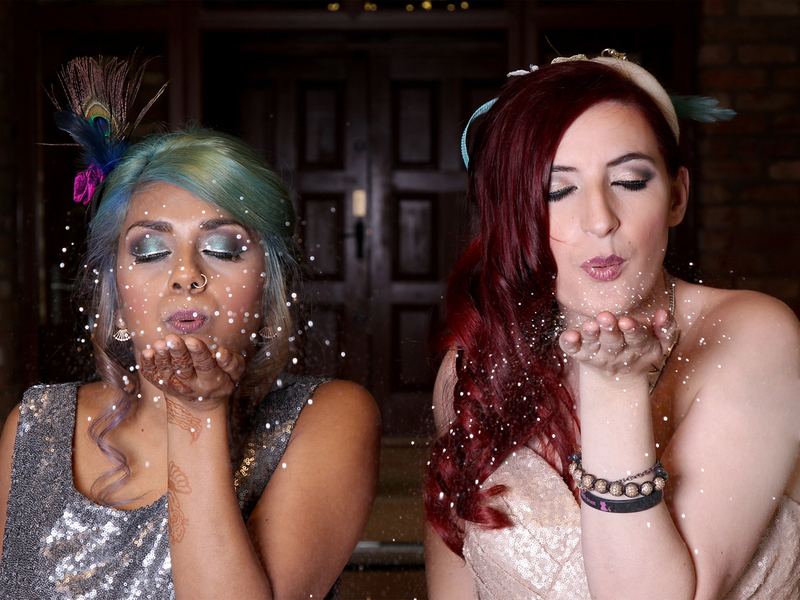 We really ramped up the glitter with unicorn blend biodegradable glitter confetti which the models had a lot of fun with! Both models had a couple of very different looks throughout the shoot. 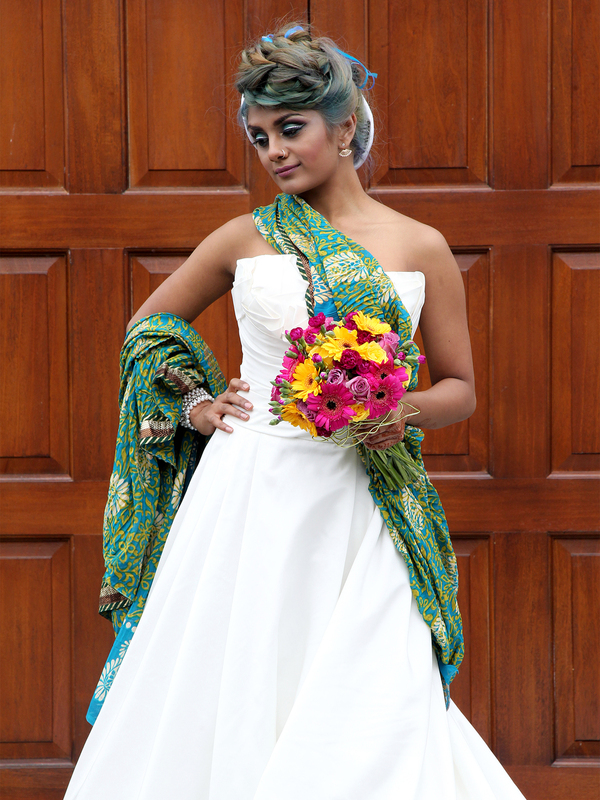 A lot of brides say to me at wedding fairs, “I love that, but I can’t wear that as I’m the bride” and I really wanted to debunk that myth with this shoot. It’s your wedding, you can wear whatever you want to wear! 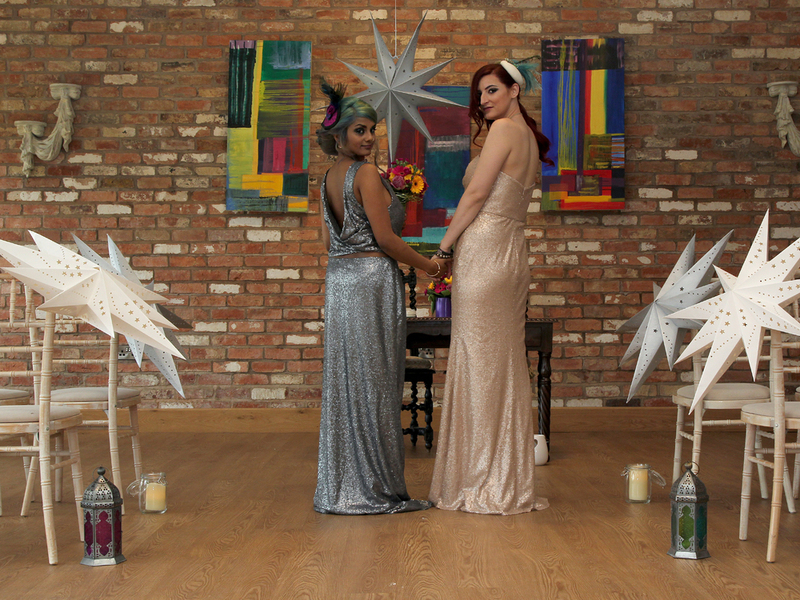 All headpieces are by Doll’s Mad Hattery – Vintage Millinery, who specialise in bespoke hats and bridal headpieces. 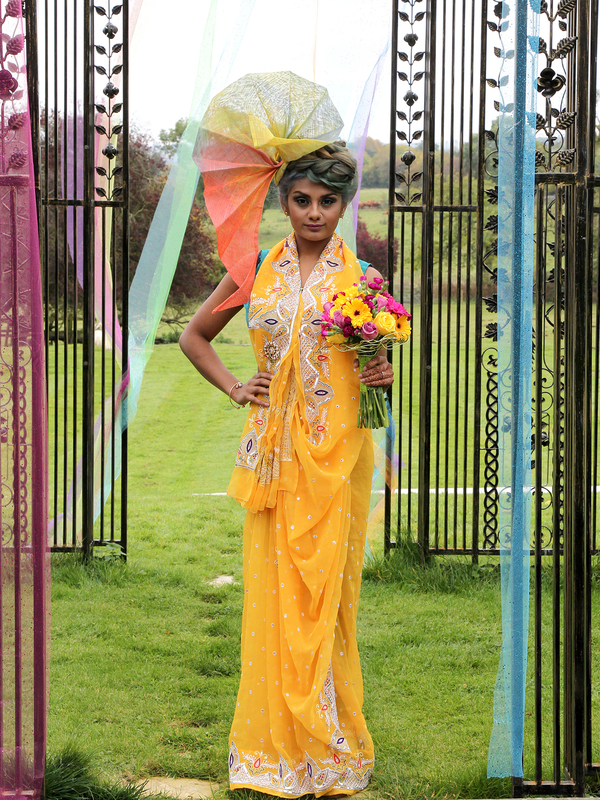 Kaajel’s first look was more traditional Asian with the vibrant yellow saree (model’s own), teamed with the definitely not traditional hand-dyed swirled shell headpiece! 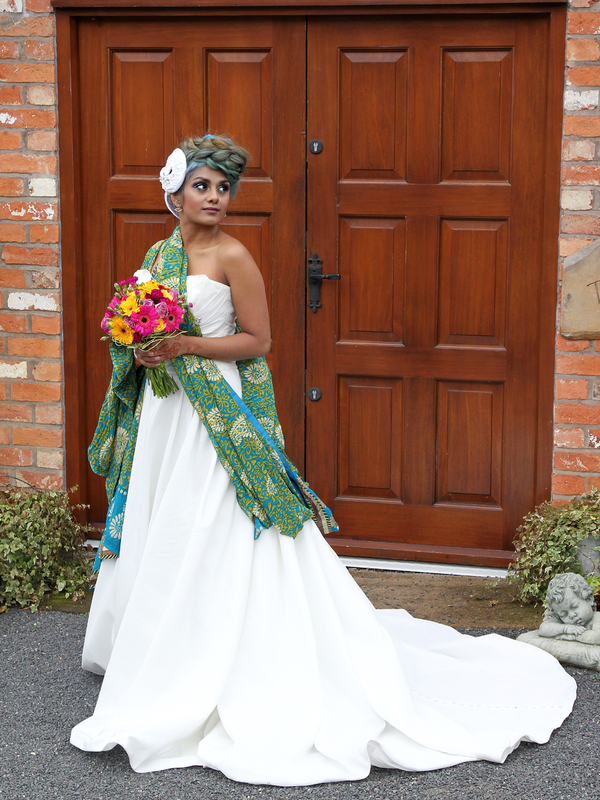 She had tiny purple tassel earrings and a bright bouquet to complete the look. Kayleigh’s first look was more traditional English bridal, with a borrowed ivory satin gown with embroidered bodice detail. 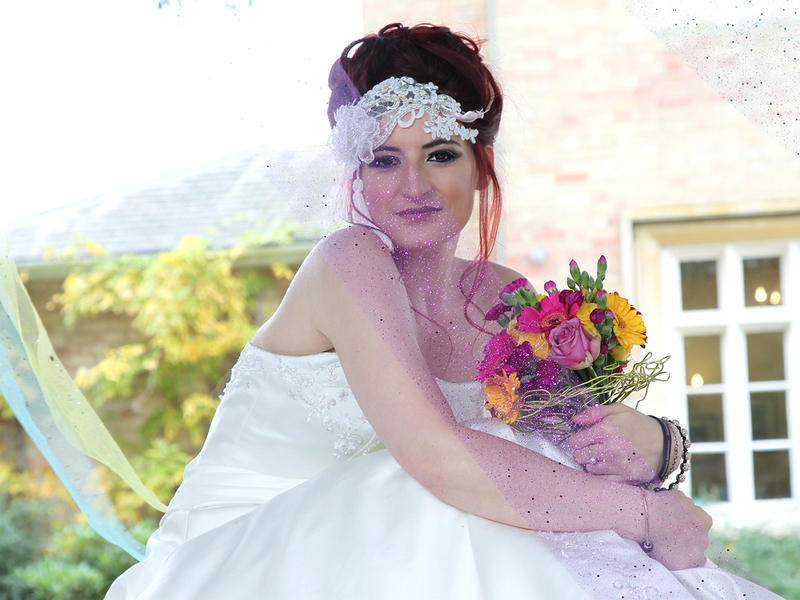 Her headpiece combined the traditional bridal lace with pearls, sequins, diamantes and organza flowers with a slightly more unusual silk tassel detail for a bit of fun. Kaajel’s second look combined traditional English bridal she wore the gorgeous long ivory dress with pleated bust detail (and pockets!) 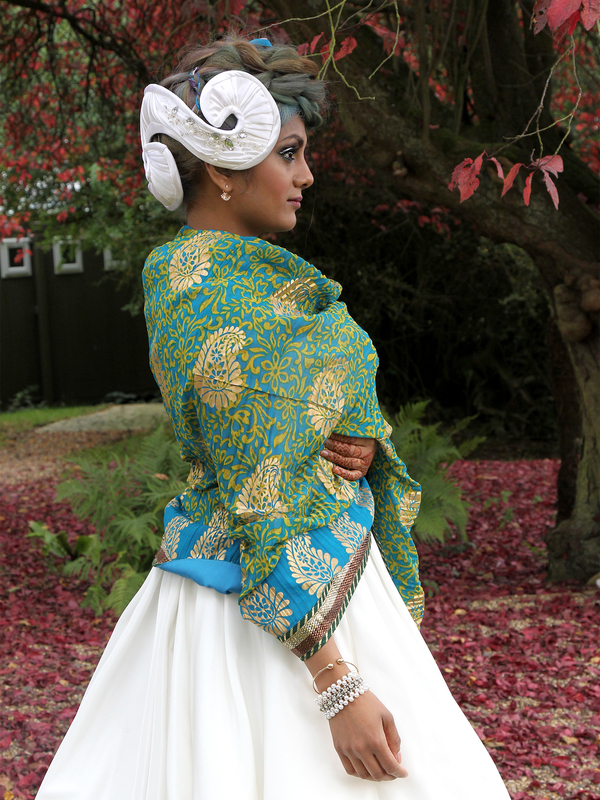 and a gorgeous turquoise and gold saree draped around her shoulders. Her headpiece is handmade in the style of a 1950s swirled half hat, with lots of pleated satin and hand beaded detail with pearls, diamantes and larger rhinestones. Absolute vintage bridal glamour! 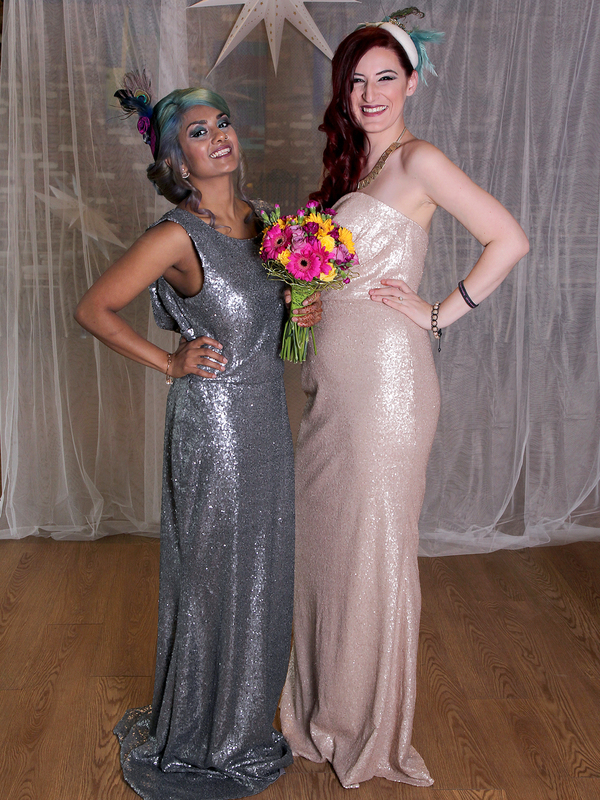 The final look for both models was the coordinating sequinned dresses from Brides of Ibstock in pewter and gold. 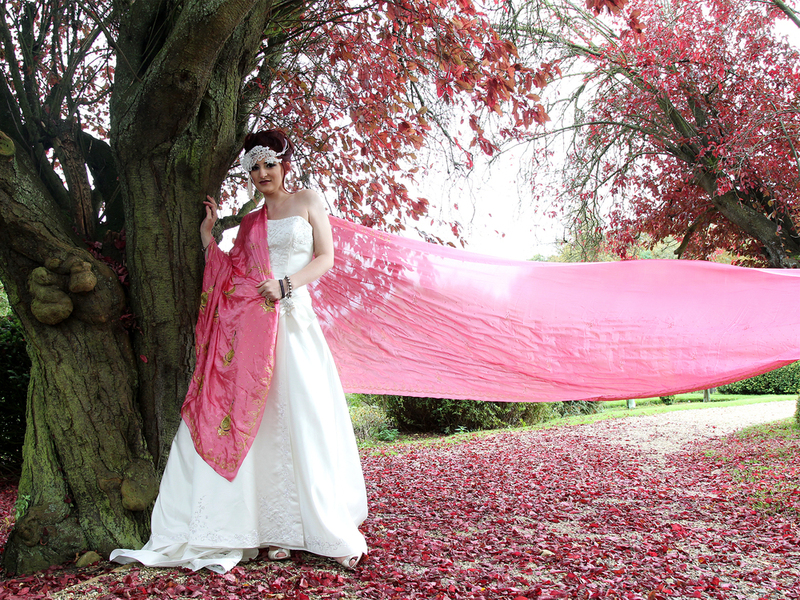 Kaajel’s headpiece is a burlesque inspired pink silk teardrop with feathers, beading and vintage buttons. Kayleigh’s headpiece is an ivory wool felt cocktail hat with turquoise feathers, lots of brown and turquoise beading, gold lace applique detail, completed with ivory veiling and a vintage brooch. 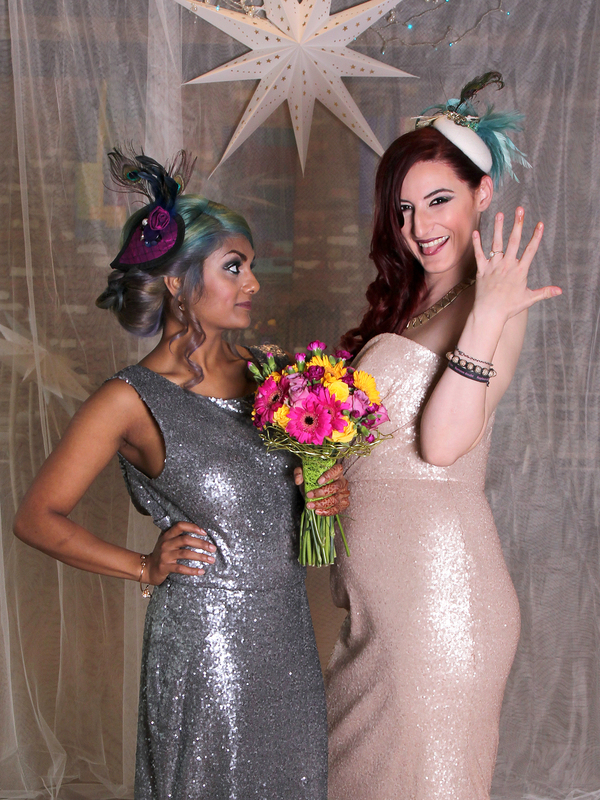 We hope that you can draw inspiration for your own wedding planning from these diverse, vibrant looks.